Looking for a low-carb, heart-healthy recipe that still fills you up? Look no further! 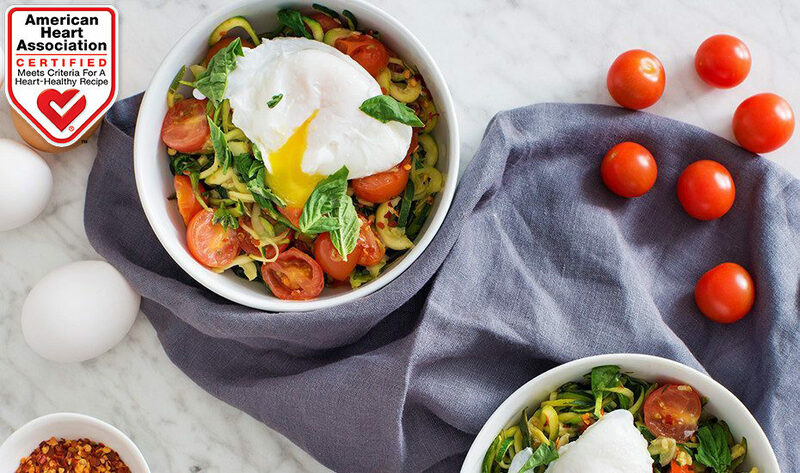 A serving of Zucchini Noodles topped with a poached egg is only 210 calories while still offering 12g of high-quality protein. Heat oil in a large, deep nonstick skillet on medium-high heat. Cook garlic and chili flakes for 1 minute, stirring continually, or until softened. Add zucchini noodles, salt and pepper and cook, tossing gently, for 1 to 2 minutes or until zucchini has softened. Stir tomatoes, spinach, lemon zest and juice gently into zucchini mixture until well combined. Cook for another 1 to 2 minutes or until spinach is wilted and tomatoes are warmed through. Meanwhile, bring 2 to 3 inches of water to boil in large saucepan or deep skillet. Adjust heat setting to keep liquid simmering gently. Break eggs, 1 at a time, into custard cup or saucer. Slip each egg into water holding dish close to surface. Cook eggs to a soft poach – about 3 to 5 minutes or until whites are completely set and yolks begin to thicken but are not hard. (Do not stir.) Lift eggs from water with slotted spoon; drain well. Use a spiralizer or spiral vegetable slicer on a setting such as curl to create shape that resembles long and thin noodles. 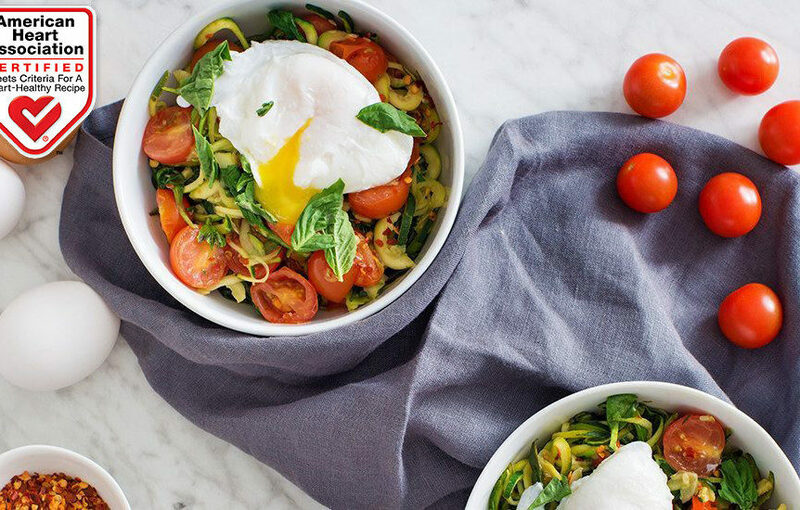 Blot zucchini noodles with a paper towel if moist or watery, before proceeding with recipe. Use very fresh eggs for poaching. They hold their shape better and form fewer wispy threads or “angel wings” in the water. Poaching gadgets: A simple saucepan and slotted spoon are all that’s needed for superb poached eggs. However, specialized poaching equipment – rings that corral eggs as they cook in liquid, pan inserts with nonstick egg-shaped cups, and steam-cooking electric egg cookers – are also available.